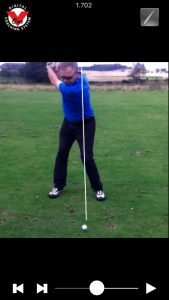 Better golf – stay to the right! I battle with a slide to the left in my golfswing. There I have said it!! I blame this recurring flaw / movement on playing a lifetime of golf at a windy Scottish links course and trying to keep the ball down. Incidentally, I moved to an inland course for a few years and was amazed how high these inland players hit the ball! Anyhow this slide makes me push or slice the ball which knocks yards off drives into a wind which means a much longer second shot to long par 4s. Also means a lot of scrambling with chipping and putting having to be relied on to get a score. So I finally decided to do something about it by looking carefully at my swing. 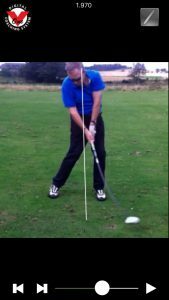 I downloaded an app for my Iphone called V1 Golf which allowed slow motion recording of my swing and a enabled a closer look at this fault. First thing I noticed was where I was at impact. I slid through with upper body over my left foot during transition from top of the backswing to impact mid downswing. This meant being forward through the ball. 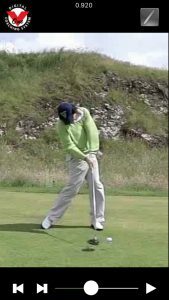 Clubhead behind my hands with obvious opening clubface caused by this move. Look at the picture on the right of a young Rory Mcilroy or VJ Sing for comparison. 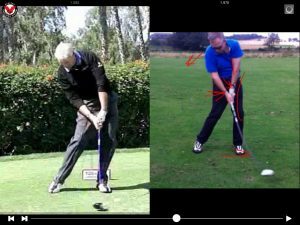 As I am getting older and am shortening my swing slightly as well to allow for reduced flexibility but extending through the ball while keeping weight on left side with a tilt to right is my swing thought. 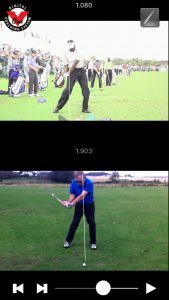 Post in comment below your thoughts and pictures of your swing .